Health • TrainingExercise Bandages: Outdated? When I was young I learnt how to bandage for one of my Pony Club badges. I had to be able to do; a stable bandage, exercise bandage and a tail bandage. However, since then things have really changed in the industry! When I was learning to bandage, fleece bandages were used over a big Gamgee square for stable bandages and elastic bandages were used over a smaller Gamgee square for exercise bandages. I learnt that you bandage to protect and/or support the leg. Now days you rarely see anyone using elastic bandages but fleece bandages have now become the go to exercise bandage. There are also now a wide range of boots available on the market, offering a quick and easy alternative to bandaging. This got me thinking about how confusing it is to know what is ‘best’ by today’s standards. So I have created and answered FAQs based on my own experiences, scientific research and industry practice. So is bandaging for exercise still useful? Yes. Bandages are very cheap compared to your average pair of brushing boots and can protect the leg just as well. 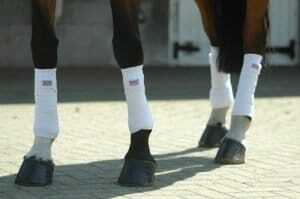 Bandaging also offers the leg support which most boots on the market can’t offer, especially not for the same price! So why don’t more people bandage? Unless you get a lot of practice bandaging and have learnt to do it quickly, bandaging is very time consuming! In most cases, you can put on 4 brushing boots quicker than you can bandage 1 leg! Also most horses don’t need the support from a bandage, so boots do perfectly fine. In theory, yes. If you bandage too loose they could slip or come undone, causing a tripping hazard. But if you do them too tight or have too much pressure on a tendon, you can risk the horse injuring itself. There has also been a lot of research over the years to suggest that the legs and tendons getting too hot during exercise increases the risk of injury. Bandages, especially bandages with pads, are going to be warmer than the average pair of protective boots, especially with all the new cooling technology going into designing boots. So should I use boots or bandages? I personally don’t think it matters as long as you can bandage to a reasonable standard. Boots is the quick and easy option. How should I use fleece bandages? Although you were always told to use Gamgee under fleece bandages, for exercise I would be tempted not to. Even the special bandage pads you can get to replace the Gamgee can warm the legs. How should I use elastic bandages? Because the elastic won’t be as nice on the horse’s skin and will likely apply more pressure than the fleece bandages, I would always use them over a pad or thin Gamgee. This is because the pad will spread the pressure out more evenly. Why do so many people use bandages if boots are just as good and easier? Having matching coloured bandages has become a bit of a fad in the industry. More and more people are bandaging just because they like how it looks. Most matchy sets come with bandages whereas not many come with boots. Where can I learn to bandage? There is loads of information out there telling you how to do it and I am hoping of doing several videos over the next few weeks about different types of bandage, so keep your eyes peeled! I’m sure there will also be someone at your yard who knows how to do it and will be happy to show you, especially if they regularly bandage their own horse.